My adorable shih tzus: Just Groomed! Finally, we were all groomed on last Saturday - 27th June 09. Our mummy gave us a fresh and clean summer look! We, Singaporean like to call it "Botak". 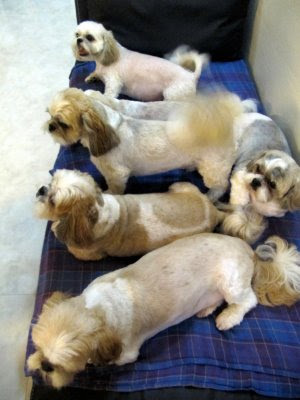 All of us have the same style, all body no hair, legs a bit of hair, fluffy tails, longer ear and round face. We looked so alike don't you agreed? 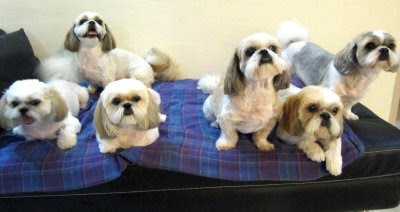 From left - Win win, Waren, Want want, Wally, Cooper & Sniper.